Game of Thrones Shield Pin: Stannis Baratheon When Stannis Baratheon’s brother and rival Renly remarks that the Stannis army’s shield design is different from his own, Stannis says he has chosen fire as the path to victory. 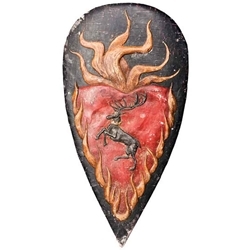 His stag emblem is aflame. Produced from the actual prop seen in the HBO series, this high-quality piece measures approximately 2.5 Inches high and 1.25 Inches across.